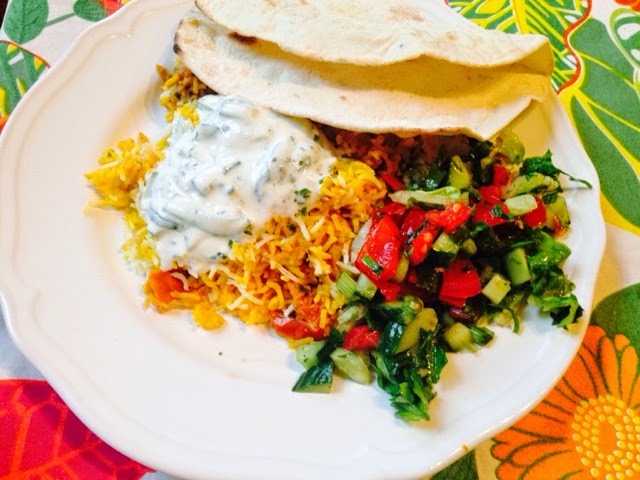 Chicken biryani and cucumber laban. 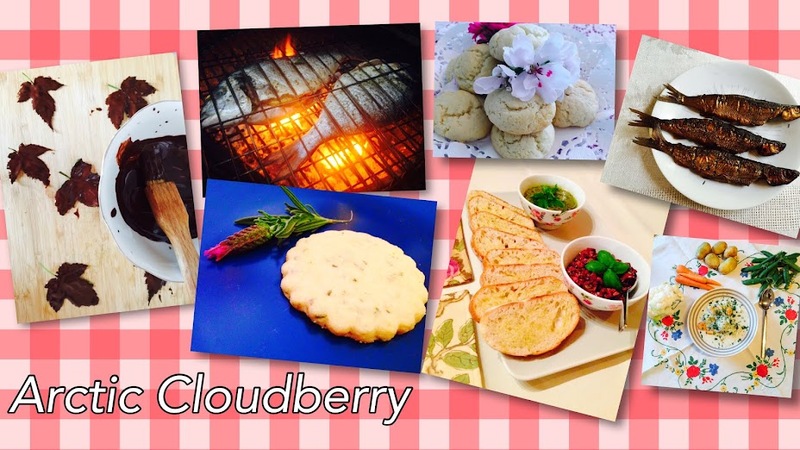 - Arctic Cloudberry Arctic Cloudberry: Chicken biryani and cucumber laban. 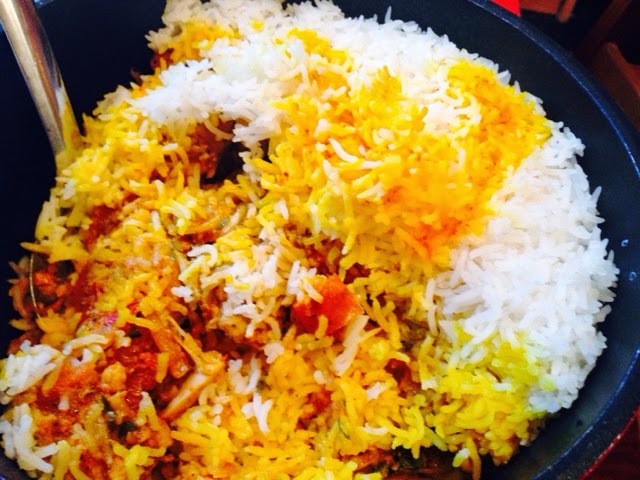 This golden mix of rice and meat is one of my favourite Middle-Eastern main courses. 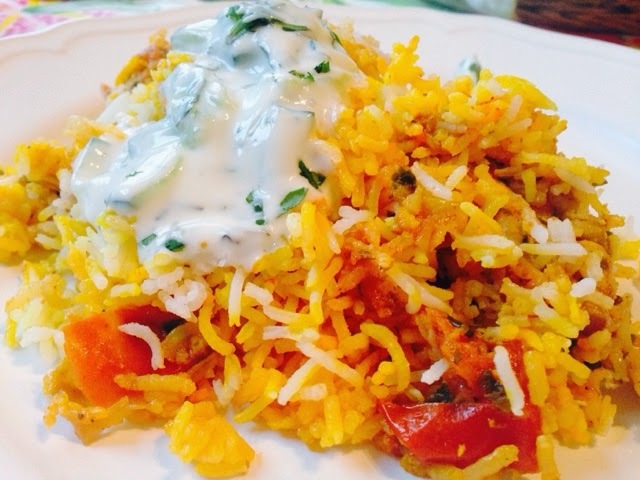 It's a dish often associated with Indian kitchen, but apparently it originated in Persia. It is hugely popular everywhere around the Gulf and is a staple in the UAE. That's where I got the taste for it. The first time I had it was in my brother-in-law's house in Sharjah where a huge banquet of food was laid out on a table cloth on the floor, everyone sat in a circle around the huge tray of biryani and lots of little bowls of side dishes and piles of soft flatbread. I loved dining on the floor even though our western stiff hips made getting back up a slow and painful business. And slightly embarrassing as all around us the elderly relatives were bouncing back up like rubber balls. Regardless of the leg discomfort I was so excited about this cozy and sociable sitting on the softly carpeted floors that coming home I was considering getting rid of my furniture. How much easier and more fun would life be with just soft rugs on floors and some colourful cushions. Unfortunately the development has gone completely the other way and furniture has made its way into UAE households. Since our first visit sofas and dining tables have appeared everywhere and some of the magic has been lost. 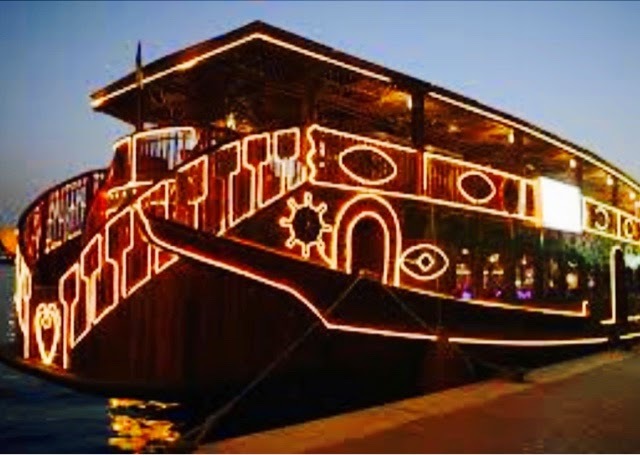 Another memorable meeting with biryani was in a little restaurant boat in the Sharjah corniche. We had been walking around the Sharjah Blue Souk. I love the little shops with sparkly cushion covers, table cloths and pashminas in all imaginable colours. I remember once one of husband's local friends was with us and started haggling so aggressively that the shopkeeper threw us out empty handed. I nearly burst into tears for not getting the gorgeous deep red cushion covers I so wanted. I did get some in an other shop after we got rid of the crazy haggler. Onboard the restaurant boat we started with a fresh salad. I loved that they brought a big bowl of fresh vegetables to the table and we then took slices of what we liked with a squeeze of lemon on top. The biryanis came in those pretty beaten copper pots and were huge. One would have been enough to share. I think husband had lamb, I definitely had chicken and it was just scrumptious. There are many ways to do a biryani and the Emirati way might be different from how it's prepared in some other countries. Some recipes seem to add the rice to the chicken sauce, but the way I think Emiratis prepare it is to cook the rice separately and then layer with the chicken mixture. 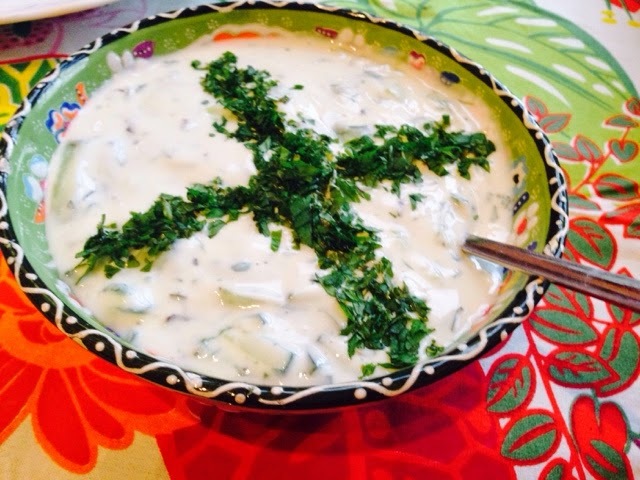 I always like to serve it with a yogurt and cucumber sauce, flatbread and a tabbouleh or shirazi salad. 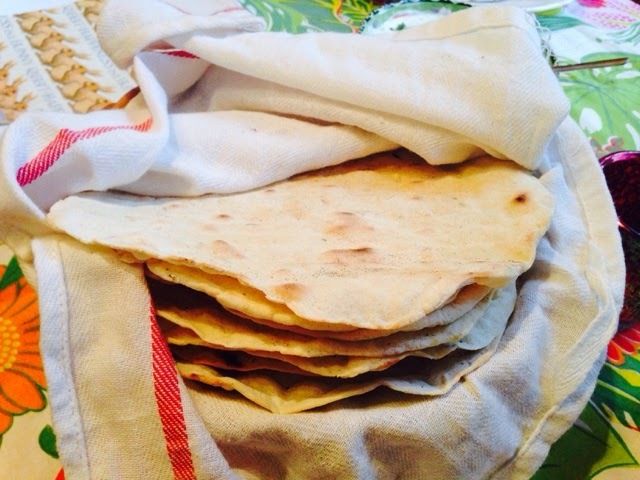 This time I made the flatbread myself, but it turned out weirdly crispy, so I'm not going to share that recipe. If anyone is specifically after a somewhat bland, but simultaneously chewy and crispy (quite an achievement) flatbread, get in touch, I'm happy to share some expert advice. Season the chicken pieces with salt and pepper and squeeze over the juice of a lemon. Leave to marinade for a few hours in the fridge if possible. Wash rice and soak mimum 30 minutes. Cook until done but not mushy. Rinse under cold water and drain. 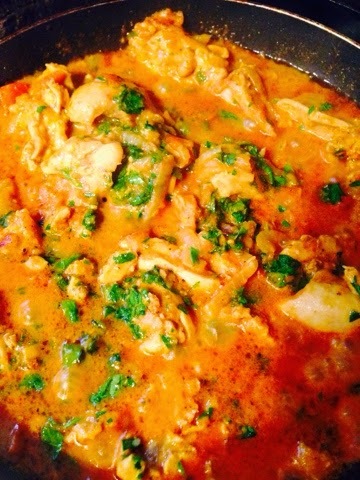 Soak a generous pinch of saffron in boiling water. I don't know if this is sacrilege, I feel somewhere in the Punjab or Manipur hair is torn and ears are covered, but I always crush saffron in mortar before pouring hot water over it - I find it dissolves much better. Peel and cut the onion into thin strips. Peel and grate ginger. Mince garlic. Chop tomatoes. Heat oil in a pan, fry onions until they start to brown slightly. Add garlic, ginger, chicken and all the spices, salt and pepper, continue to fry until chicken is browned. Add tomato paste and yoghurt. Cook sauce on low heat covered for 30 minutes. Check the seasoning and add spices or salt if necessary. The sauce should be very tasty as the rice that is layered around it is not. If sauce looks too watery let it cook uncovered for a few minutes. It should be quite saucy as the rice will absorb it. When the chicken is cooked add in the fresh herbs. 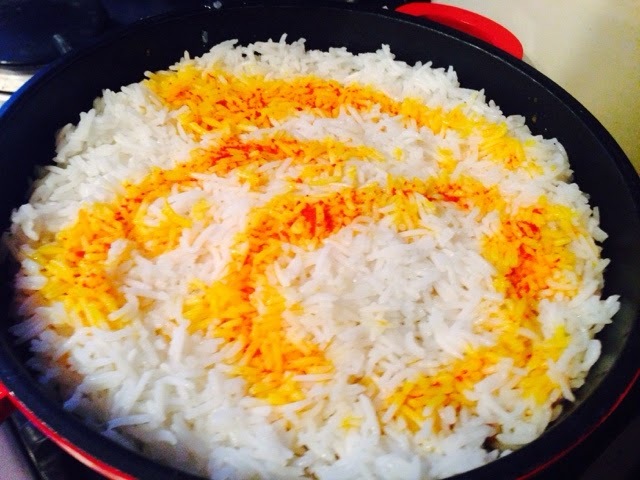 In the bottom of a oven casserole dish or biryani pot spoon a thick layer of rice - I usually put 2/3 of the rice in the bottom, pour 1/2 of the Saffron water on top of the rice and sprinkle some rosewater, then spoon all the chicken sauce on top and cover with the rest of the rice and pour the rest of the Saffron water on top along with a final sprinkling of rosewater. Cover with parchment paper and foil and bake in 170C over for about 40 minutes. Chop the cucumber finely - I sometimes drain excess water out by leaving it stand with a sprinkling of salt for a while and then press dry in kitchen towel, but that's optional. Mix yoghurt, cucumber, lemon, herbs and grate in a small glove of garlic. You don't want garlic to overpower. Season with salt and pepper. Refridgerate for a few hours for best taste, but it can be served immediately. Garnish with fresh mint. We offer bespoke curtains and drapes in Dubai. We have a Large range of UK fabric brands with full poles and accessories. All Custom made.